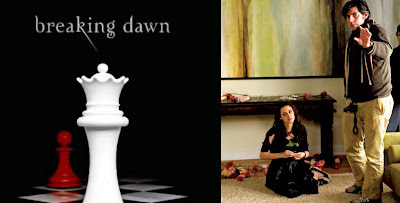 We still are a month away from "New Moon" releasing and nearly a year before "Eclipse" will release but Weitz added fuel to the rumor that he could return to direct the fourth Stephenie Meyer novel. THR asked if an offer had in fact been made to the American Pie and The Golden Compass director. He said, "No official offer has been made." Despite Weitz shooting down confirmation of a offer, he did elaborate on the topic. "The fans have been enthusiastic about the footage and the trailer, and the studio responds to that by feeling good about me. We'll have to see how people feel about the entire movie, not only the studio but the fans, before the verdict is out whether I direct Number 4," Weitz said. Director Chris Weitz concluded his comments on directing the fourth film by saying that his favor could all change once "Eclipse" releases. He said, "David Slade is doing a great job on the third film, and by the time that comes out, he'll be the flavor of the moment." Head over to THR to see what else Chris Weitz had to say about working with Stephine Meyer, the casting change of Rachelle Lefevre and interacting with Twilight fans.